Spartanburg Boy, Fighting Under British Flag, Killed in Action September 26th-27th. W. Montage Nicholls, [Citadel Class of 1912] second lieutenant in the royal field artillery of the British army and a son of Mr. and Mrs. George W. Nicholls, of this city, was killed in battle the 26th or 27th of September , according to a cable received yesterday morning by his father from the British war office in London. 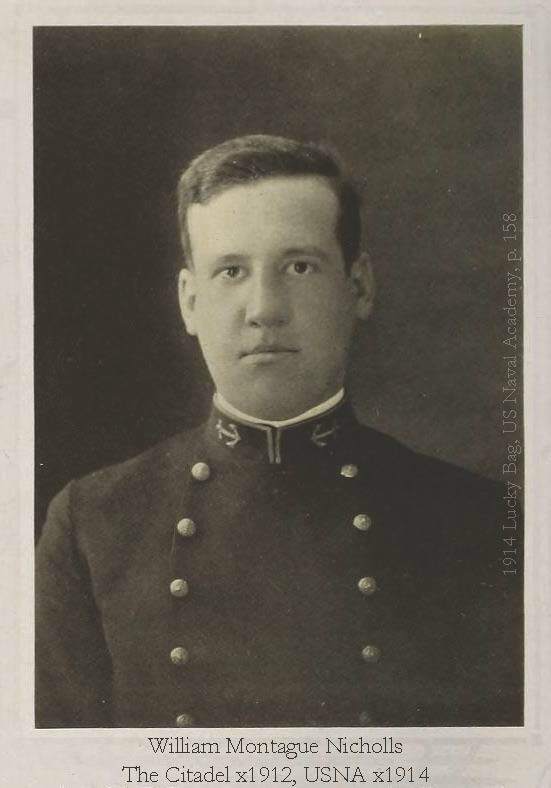 W. Montague Nicholls his Senior year at the US Naval Academy. Shortly after the receipt of this message, Congressman-elect Sam J. Nicholls, brother of the fallen soldier, sent a cable to the British was office asking for fuller information and asking also if arrangements might be made to have the body shipped here for interment. Friends of the family, it is understood, have also wired the United States secretary of state asking assistance in this undertaking. The sad news traveled rapidly through the city and county and members of the family were the recipients of many messages of sympathy which poured in from all parts of this section of the state during the afternoon and night. It is probably that within a few days some further information will be received from the British war authorities relative to the death of Lieutenant Nicholls. No additional facts, of course, had been received up to last night. Montague Nicholls was born in Spartanburg December 1, 1891, and hence was nearly 24 years of age. He graduated with first honors at the city high school, winning the scholarship to Wofford college. He attended Wofford one year and then went to The Citadel at Charleston. During his second year at The Citadel he won his appointment to the naval academy at Annapolis, Md. 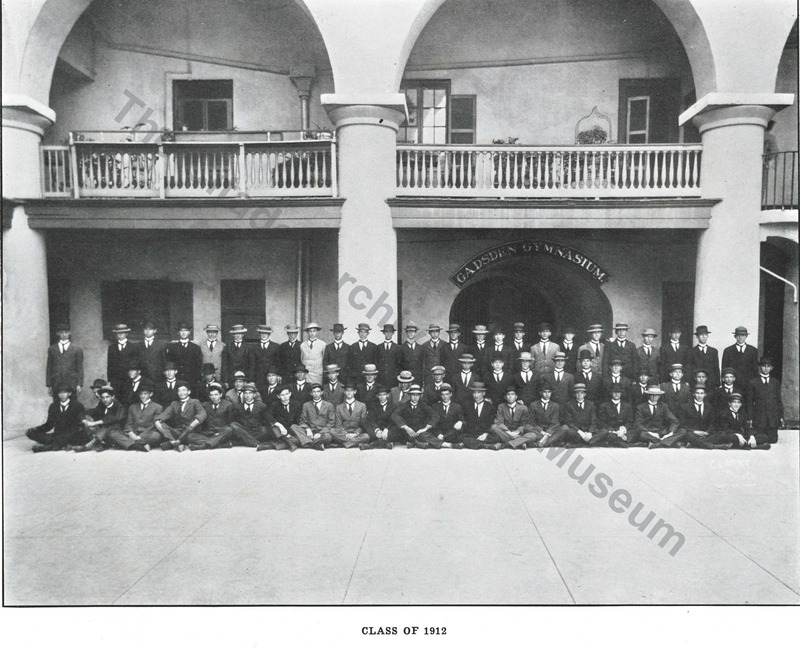 Class of 1912 upon reporting for the 1908-1909 academic year, inside the ‘old’ Citadel located on Marion Square, Charleston, S.C. Photo courtesy of The Citadel Archives and Museum. His career at the naval academy was featured by his athletic record and his interest in the sports. He won the welterweight championship in both boxing and wrestling. He made both the football and the baseball team, starring as quarterback on the football team and making a fine record as right fielder on the baseball team. Young Nicholls resigned from the academy in April, 1914, about six weeks before his graduation. He did this, it is understood, because he did not desire to enter the navy, and letters testifying to his good standing were issued to him. He then came to Spartanburg and began to read law in the office of his father. He continued this until war was declared in Europe, when he decided he would enlist and go to the front with the British troops. With this purpose in mind, young Nicholls left Spartanburg on September 1, 1914, and went to Toronto, Canada with the idea of enlisting in the British navy. He was rejected by the recruiting officer, however, for the reason that he was from a neutral country. Not discouraged, he returned to New York and a few days later sailed for Europe, where he made further efforts to enlist. One the first attempt, he was rejected again for the same reason that had turned him down in Canada. He wrote his parents about this time that he intended to go to Paris to try to enter the foreign legion, but he did not make this trip. Instead, he found that he was able to join a volunteer regiment, formed by a number of wealthy Americans and Englishmen. His knowledge of the science of war was quickly recognized, and he later was able to join Lord Kitchener’s expeditionary forces, and was later commissioned as second lieutenant of the Royal Field artillery. It is understood here that in order to receive this commission Mr. Nicholls was obliged to take the oath of allegiance to the British flag. After receiving his commission , he was sent to Glasgow, Scotland, where he remained for several weeks in a training camp assisting in training the troops. His battery was sent to the battlefront in France on the 22nd of February, and soon after, Lieutenant Nicholls was assigned to a battery on the front having charge of six three-inch guns. During the fighting on the first of March, he received flesh wounds in both thighs, and shortly after was transferred to a hospital in Folkestone, England. He remained at Folkestone for about six or eight weeks, and then, having fully recovered, was assigned to duty in another section of England in drilling recruits. About the first of July Lieutenant Nicholls was sent back to France to resume his duties at the front. He was placed in charge, and was in active service until his death. The last letter received by the family from the young man was dated September 13, though it was not received here until Tuesday of this week. The letters from the soldiers on the front are all read by censors before they are transmitted, and statements relative to the fighting operations are very carefully scanned before they are passed. Hence the last letter contains practically no information of the fighting operations and is confined principally to personal topics. In this letter the young soldier expressed his continued enthusiasm for the war, and his intention to stay until it was over. He intimated that after the war he would remain in the service and would probably be assigned to duty in India. The letter shows that the young man was with the Forty-third brigade, Thirtieth battery, R. F. A. The letter referred, in a humorous way, to the war as being his third choice for a profession and expressed the hope that he would find it satisfactory. Members of the family interpret this to mean that he had tried the naval service and the profession of law and had not found in them the satisfaction of his aspirations. A touching feature of the letter was the young officer’s request for a shipment of buckwheat cakes and maple syrup. It appears from the letter that it had fallen to his lot to provide a variation from the routine of the officer’s mess, and he had decided upon this as a treat for his comrades. He stated that no package weighing more than 11 pounds would be allowed to pass through, though there was no limit to the number of packages. After the war, when permanent cemeteries were being established, W. Montague Nicholls remains were either unidentifiable or missing after so many years in a shallow battlefield grave. 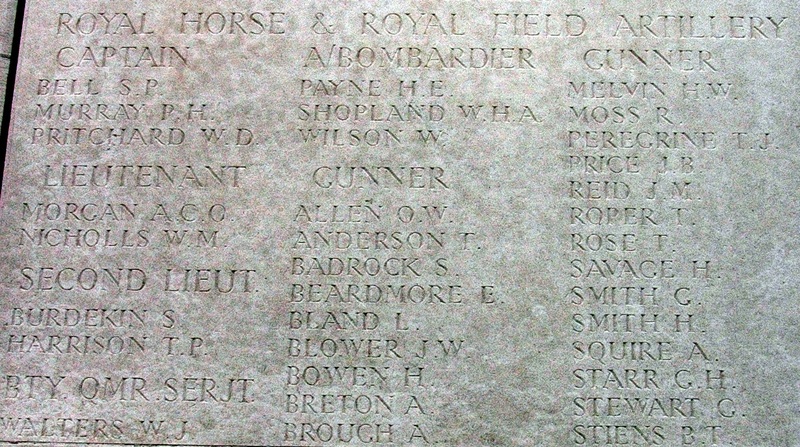 He is remembered on the British Commonwealth’s Loos Memorial, Dud Corner Cemetery, Loos-en-Gohelle, France. Montague Nicholls is well remembered by Spartanburg people and his death in arms for a foreign yet closely related country brought sadness to hundreds of people of this vicinity who knew him as a boy and as a young man. Young Nicholls is survived by his father and mother, one brother, Congressman elect. Sam J. Nicholls, and two sister, Misses Kate and Lottie Led Nicholls. – Source: The Spartanburg Herald, Spartanburg, S.C., Friday Morning, October 1, 1915, p.1. Source newspaper archived at the Spartanburg County S.C. Public Library’s Kennedy Room. The correspondence and documents of U.S. Senator Sam J. Nicholls, Montague’s brother, are archived at Duke University’s Library and Archives in Durham, North Carolina. According to the archive catalog, contained within the more 10 boxes holding some 5000 items, are letters concerning the death of Montague and the subsequent requests to repatriate his remains. This past summer, I contacted Duke but did not have time to go there and begin to research further into the life and death of Citadel Man and Bulldog Football star, William Montague Nicholls. Maybe I will get to Duke on my next visit back home. I still have not made it to the Loos Memorial although it is only about a three hour drive from my home. There may be a possibility to go there during the Christmas holiday break. I look forward to the opportunity to put an American flag and a Citadel flag near Montague’s name and honoring his service and sacrifice. This entry was posted on September 26, 2013 by Roger Long. It was filed under Commonwealth Wargraves, Loos, Obituaries, Uncategorized and was tagged with Battle of Loos, citadel campus, Citadel Men, Loos Memorial, Royal Field Artillery, S.C., The Citadel, WWI.